In a small bowl, mix together the pork seasonings. Place the pork roast in a crock pot and coat with seasonings. Add the onion, garlic and orange juice in the bottom of the crock pot. Allow to cook for 4-5 hours on high or 7-8 hours on low. For the black beans, heat the oil in a large cast iron skillet. Add the onion and bell pepper to the hot pan and saute for 3-4 minutes, until soft. Add the garlic and saute 30-60 seconds. Add the black beans and spices and cook for 5-10 minutes. Using a potato masher, mash about ½ of the beans in the pan, then mix it all together. Taste and adjust seasoning, if necessary. For the rice, heat the oil in a large saucepan at medium-high heat. Add the onion and saute for 3-4 minutes, until soft. Add the rice and stir to coat with the oil. Add the chicken broth and increase the heat to high, allowing it to come to a boil. Reduce heat to a simmer and place the lid on the pan. Cook for about 15 minutes, until most of the liquid has absorbed. Turn off the heat and allow rice to sit with the lid on for an additional 5 minutes. Add the lime, cilantro and season with salt and pepper, to taste. Cook the plantains just before serving: Add the oil to a cast iron skillet. Place the plantains in the hot oil, sprinkle with salt, and cook for about 30 seconds on each side, until they start to caramelize. 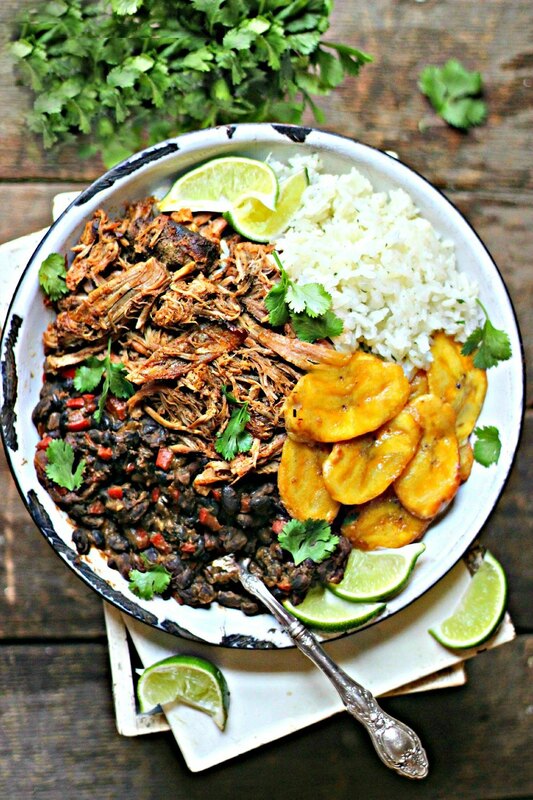 Remove from the heat and serve on top of the rice, black beans and pork.